Margaret Gordon, 69, of Norridgewock, and her daughter, April Gordon, talk about the billing problems they have with CMP. Central Maine Power Co., Maine’s largest electric utility, provides electricity to their condo. The Trussells have been customers of the company for four decades. In that time, they never had a problem with their electric bill. That changed in February when Sally Trussell, relaxing in Westminster, South Carolina, opened an email from CMP containing her January electric bill. It was nearly $1,500. “I almost had a heart attack,” Trussell said. CMP charged her $1,484.98 for using 6,456 kilowatt hours of electricity in January 2019, a month in which her condominium was empty. To put that amount of electricity usage in perspective, it’s about the amount an average CMP customer uses in a year, according to the company’s website. “It’s an impossible number,” Trussell said. Trussell’s electric bill was usually around $150 a month, and that was when both Trussells were living in the condo and using electricity. After receiving the January bill, she had a neighbor and her condo association check on her apartment. Everything was normal, she was told. Trussell looked at previous CMP bills and realized that her bill for December, the month following her and her husband’s move south, was $600. The amount had been automatically deducted from her account through autopay, which she had recently enabled. CMP made headlines across the state for billing increases that coincided with both a new customer account system rollout and the October 2017 wind storm that knocked out power to much of Maine. The company admitted that 97,000 customers saw their bills spike 50 percent or more. While CMP has tried to assure the public that its billing problems are behind it, records and interviews with customers conducted almost a year and a half after the problems first emerged show the company is still struggling to convince people its bills are accurate. In addition, a review of documents on file with the state’s utility regulator show CMP has tried to have customer complaint cases closed before they were actually resolved and tried to lay blame for an unprecedented volume of billing complaints on media coverage. The Trussells never had problems with their bills in the months following the storm or the rollout. But their January 2019 bill said their unoccupied condo had consumed nearly 500 percent more electricity that month than it had in January 2018, when both Trussells were there, according to bills they shared with the Bangor Daily News. Assuming there must be a mistake, Trussell contacted CMP. They told her the usage for January was accurate. Emails Trussell exchanged with CMP returned the same verdict: The reading from her Smart Meter was correct. A February bill followed. It was less than January but still more than $550, a number Trussell believed couldn’t be right for an empty condo heated by oil. By the time March rolled around, Trussell had contacted the Maine Public Utilities Commission and Sumner Lipman, a former Republican lawmaker and lawyer who is trying to bring a class action fraud lawsuit against CMP for overcharging customers. The balance on Trussell’s account was more than $2,000. Then came the March bill. Trussell was pleasantly surprised to find the balance she owed had simply disappeared without any explanation as to why her electric bills had soared. Mistakes, including high bills, missing bills and unreachable customer service, have eroded faith in CMP across the state. The company is facing two PUC investigations related to billing, a lawsuit and calls for a government buyout of the utility. These are responses to billing and customer service issues that still seem to haunt the company almost a year and a half since it rolled out SmartCare, its new billing system, in October 2017. While the number of customers facing problems may amount to little more than a rounding error for CMP and its parent company Iberdrola, a multinational energy giant with 34.7 million customers, a few thousand Mainers have hundreds and, in some cases, thousands of dollars, riding on whether regulators can get to the bottom of what is going on with CMP. Customers who feel they have been overbilled have a choice: Pay the bills they believe to be inaccurate and illegitimate and hope they will be refunded money at the end of the investigation, or pay only what they believe they owe and hope their growing balances won’t come due at the end of the PUC’s investigations, which are expected to conclude in the fall. The company declined to comment for this article, but it has tried to assure the public in recent months that its bills are accurate as it also seeks to secure permits and public support for a controversial $1 billion transmission line project. The PUC is expected to hold a vote Thursday to decide whether to issue the company a certificate of public convenience and necessity, one of several approvals the company needs to build the line. The vote will come as the PUC is also conducting three separate investigations into the company. “As of today, more than 99 percent of customers are receiving timely and accurate bills,” Central Maine Power CEO Doug Herling wrote in a Feb. 22 letter to the PUC. Herling also said that delayed bills for new customers would be resolved by the end of April. But customers continue to report problems. One percent of CMP’s more than 600,000 customers would still represent more than 6,000 ratepayers. “We’re going on two years, and we still have billing issues, still have metering issues and still have consumer complaints coming in,” Public Advocate Barry Hobbins said. Rita George, 54, of Shapleigh is worried she will owe the company money for electricity she doesn’t believe she’s used. She moved into a 733-square-foot home with her teenage daughter in December 2017, shortly after the SmartCare rollout. Her electric bills seemed bizarrely high, typically running more than $300 a month. She called CMP to complain and was told that something must be wrong with one of her appliances. But they were all new when she moved into the house, she said, adding that she heats with oil and uses an on-demand hot water system. CMP customer service representatives had her run a breaker test, she said. The CMP employee she spoke to on the phone also suggested the high usage could be due to her water pump, so she had an electrician take a look at the pump. He said it was working fine. She complained about the bills to the PUC, but after a CMP worker came to her house and concluded her meter was functioning correctly, she received a letter from the PUC that said her case had been resolved. She called them and told them it had not. Her bills continued to climb. Starting in January, CMP began sending her monthly bills for more than $500 that said she used more than 3,100 kilowatt hours a month, or about half of what a typical Maine home uses in a year. Her February bill was $529. In March her bill was $521. Because she hasn’t been paying those bills, her balance with the company is now more than $4,000. In late March, she called CMP again. She said she was told that “something in your house is drawing all of this electricity.” The representative told her that she could see her usage was spiking between 1 and 3 a.m., a time when George and her daughter are asleep. “Are my cats getting up and having a party?” George said. George recently retired from the medical field, and was planning on working 25 to 30 hours a week to support herself and her daughter, who works after school, when she moved into her new house. But because of her CMP bills, she is now working full-time at Lowe’s, saving money in case her bill comes due at the end of the PUC’s investigations. It’s unclear how many CMP customers have money riding on the outcome of the PUC’s investigations and what that total amount is. While 97,000 people saw their bills spike by 50 percent after the storm, the independent audit conducted by Liberty Consulting Group and commissioned by the PUC put much of the blame for that spike on an unusually cold winter and an 18 percent increase in electricity prices that went into effect in January 2018. Though no one has solid numbers, there are at least a few thousand people who believe they have been billed improperly high amounts. Since the windstorm, the PUC has referred more than 3,400 customers with complaints of inaccurately high billing to CMP and instructed the utility to set up a special “high usage team” to resolve those customers’ complaints. As of April 1, CMP told the PUC it had resolved 1,159 of those complaints to the customer’s satisfaction, was unable to resolve complaints from 1,152 customers and was unable to reach another 1,113 customers, according to Derek Davidson, director of the PUC’s Consumer Assistance Division. That means that the company was able to resolve complaints for about half the customers it was able to reach, according to CMP’s accounting. However, CMP’s accounting appears to be inaccurate. The PUC sent letters to the people whose issues CMP had resolved, informing them that their cases had been closed. Of the 1,159 customers that received those letters, 192, or almost a sixth, contacted the PUC to inform it that their high billing complaint was, in fact, not resolved at all, Davidson said. Also, the “high usage” team responsible for taking the most serious and difficult customer complaints didn’t record its conversations with customers, representatives from Liberty Consulting Group confirmed during PUC proceedings. That worries Lauren Loomis, 30, of Kittery, one of the administrators of the Facebook group CMP Ratepayers Unite, which formed in February 2018 and now has close to 8,000 members. Loomis has been representing the ratepayers group as an intervenor at the PUC. As an intervenor, she has access to classified lists of customer complaints handled by the “high usage” group, along with the notes the group’s staff wrote about their interactions with customers as part of that work. On that list she found her own complaint, and the conversation described in the related notes was much different than what she remembered. She explained what she found during PUC proceedings in March. Loomis told the BDN the notes described her as “satisfied” and her complaint resolved. “That’s not how it went,” Loomis said. Curious about the discrepancy, Loomis started comparing posts in the ratepayers Facebook group about interactions with the “high usage” team to the notes describing those same conversations. “Their notes aren’t matching what customers were saying,” Loomis said. “In some cases, they’re not calling people, or they’ll do it during the day when they’re working, and then they’ll send out a letter saying, ‘Your case is closed,’” Lipman said. Davidson noted that it “doesn’t necessarily surprise” him that CMP and customers sometimes disagree on whether a complaint is resolved or not. “That’s the reason we send letters,” Davidson said. In addition to the customers that filed complaints, another 1,143 customers have qualified for the PUC’s interim payment policy, which it put in place in April 2018 to prevent CMP from disconnecting customers with past due balances who believe they were being overbilled. The policy allows customers to essentially pay what they believe they owe, based on bills from the corresponding month before the 2017 windstorm. The number of customers who have unresolved billing errors is likely the sum of the 1,100 customers on the payment policy and some portion of the 3,400 who filed complaints, according to Davidson. Whatever the exact number, the situation, and the variety of mechanisms that the PUC has set up to deal with it, is unprecedented. CMP has tried to blame the number of customer complaints in part on media coverage of billing issues. In December, Liberty shared a draft of its final audit report with CMP for fact-checking purposes before release to the public. CMP made suggested edits to the document, which was later submitted in response to a PUC data request. One of the edits CMP suggested was to have Liberty add “intense media coverage” as a reason why “large numbers of customer complaints followed CMP’s introduction of SmartCare.” Liberty did not include that edit in its final report. Lipman said he has been contacted by more than 10,000 CMP customers about his lawsuit. He also believes the number of CMP customers who have seen their bills increase by an incorrect amount could be as high as 200,000. He said he currently has staff working “around the clock” analyzing bills from customers in an effort to come up with a dollar figure for the amount the company has overcharged customers. That group of 10,000 customers who contacted Lipman has some overlap with the nearly 8,000 members of the Facebook group CMP Ratepayers Unite, the place where many frustrated CMP customers post questions, bills and stories about dealing with CMP. Krystie Lee Pottle, a massage therapist living in Belfast, started the group in February 2018 after her monthly electric bill jumped to $650 that winter and she read similar stories of high bills on local community message boards. The group quickly took off, gaining a thousand members in a month. Pottle is now working to support Democratic Rep. Seth Berry’s call for a publicly owned utility. CMP has never reached out to the group, its Facebook administrators said, despite it being essentially a litany of first-person horror stories about interactions with the company, complete with photos of bills. It’s not like the company wasn’t monitoring the group. In February the group’s Facebook administrators noticed that Catharine Hartnett, a spokesperson for Avangrid, a subsidiary of Iberdrola and a CMP parent company, had been a member of the group since April 2018. In addition to CMP customers who believe their bills are too high, there are thousands of CMP customers who didn’t receive bills at all for much of 2018. The problem started after the rollout of the SmartCare system, but it didn’t end there. The number of delayed bills increased from nearly 7,000 in December 2018 to almost 9,000 in January 2019, according to a PUC staff report. In December, the company said it had a backlog of 3,400 pending accounts that represented homes and businesses that were receiving electricity but weren’t yet set up in the company’s billing system. Finally, CMP resumed billing the Gordons for their electricity in February 2019. The bill stated that Margaret Gordon, who said she lives on her late husband’s Army pension, owed the company $2,633.28. After receiving the bill, April Gordon called CMP, which offered a payment plan that would require the Gordons to pay their electric bill in full every month, plus an additional $109 to pay down the balance owed. For March, the company charged them $299.04, meaning they would have to pay more than $400, an amount Margaret Gordan said she can’t afford. On Friday, April 5, the Gordons received a notice that CMP would be disconnecting their electricity. The notice, reviewed by the BDN, said the Gordons needed to pay CMP $2,633.28, or their electricity would be turned off on Tuesday, April 9. A call to CMP got the Gordons a three-day extension to Friday, April 12, and the offer of another payment plan Margaret Gordon said she couldn’t afford. 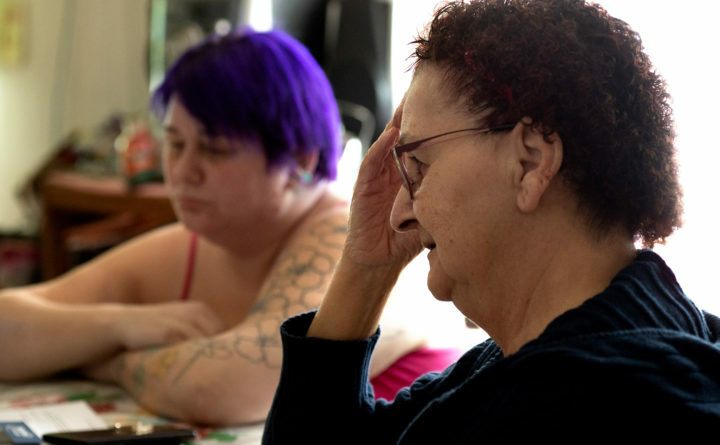 On Wednesday, she sat in her living room in Norridgewock, distraught over the prospect of losing electricity, which powers her oven, her phone and her refrigerator. Later that day, on the phone with CMP, Gordon was told the disconnect process had been halted because the PUC was investigating her account. Lipman, who said he worked with the PUC to prevent Gordon’s disconnection, said the disconnect notice was “a total violation of the PUC rules,” which mandate that electric companies should not disconnect customers during the “winter disconnect period” between Nov. 1 and April 15. “It just shows how screwed up their software program is,” Lipman said, adding that if CMP can’t bill people properly it should “eat” the cost of electricity. He added that low-income Mainers living paycheck to paycheck can’t afford to pay electric bills of more than $1,000 because CMP’s bills were delayed for months. “It’s not the consumer’s fault that they don’t get bills,” Lipman said. PUC rules require utilities to bill customers every month. There is no established procedure at the PUC for dealing with customers who didn’t receive bills for months on end, said the PUC’s Davidson. “What we would expect is if the customers went an extended period of time without a bill they would get an extended period of time to pay the bill without any sort of penalty,” Davidson said. At the end of March, CMP CEO Herling wrote to the PUC to assure regulators that CMP had completely cleared the backlog of delayed bills for already-existing customer accounts. But there were still 1,314 new customers who had yet to receive bills, a backlog the company was hoping to eliminate by the end of April. The PUC started a “summary investigation” into CMP’s billing issues last year, but it didn’t order a full investigation, which allows for intervenors to make data requests and cross examine witnesses, until January. That investigation, which overlaps with another investigation into CMP’s rates, has focused on litigating the conclusions and methods of Liberty’s audit, which examined billing from November 2017 to April 2018. The audit concluded that “CMP’s meters produce accurate measurements of customer usage” and that the company’s “meter-related databases and communications systems” accurately store and transmit data to SmartCare. “We attribute high bills this past winter season to cold weather and supply rate increases,” the authors wrote in their final report. However, there are contradictions within the Liberty report, which found the SmartCare system wasn’t properly tested and was launched before it was ready. Liberty also identified anomalies in the company’s smart meters that can occur under certain conditions when CMP restores power after outages. The meters can then record either too much or too little usage. The report’s seemingly contradictory conclusions have been frustrating for ratepayers trying to understand CMP’s system. “It’s like [Liberty] is not leaning one way or another, and they wrote a report so anybody could take it either way,” Ratepayers Unite representative Loomis said. Some have suggested that smart meters have caused the problems, prompting some customers to choose to pay a small fee every month to replace their smart meter with an old-fashioned analog meter. But it hasn’t necessarily resolved their issues. Others, who opted out of CMP’s initial smart meter rollout, have still had billing problems. Charles Berdan, 52, is an antique dealer who lives with his spouse in an 18th-century house in Newcastle. Not wanting to change anything on the old house, he decided to pay the $15 monthly charge to keep his two analog meters. The company is supposed to send someone to read those meters, but his bills have been estimated for 12 of the last 15 months, according to a bill shared with the BDN. Berdan’s February bill was $430 based on usage of 2,500 kilowatt hours of electricity, or almost three times what the company said he used in January. Berdan described his many attempts to resolve billing issues with CMP customer service as “laughable.” His March bill said his usage had jumped to 4,763 kilowatt hours. He owed the company $796.81 for the month.